Over the past 11 years and my numerous visits to London I’ve seen and done more or less all the major touristy things. 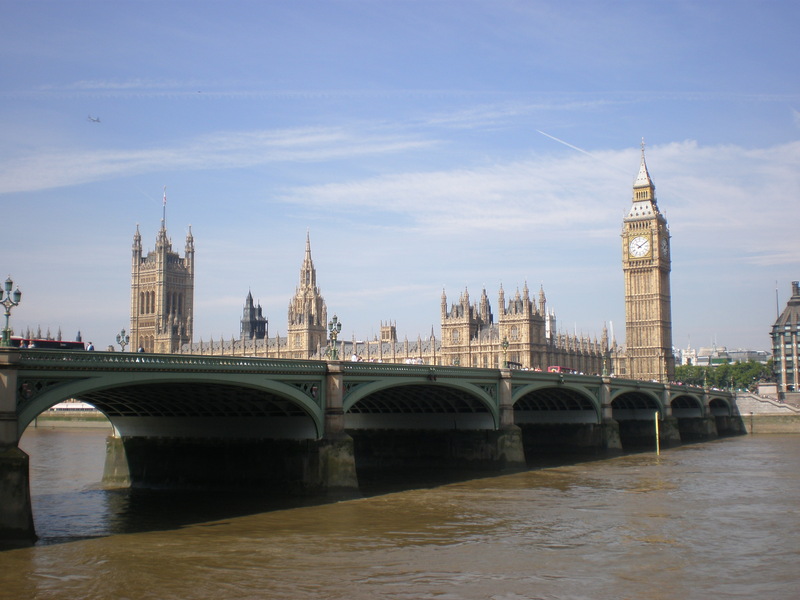 I’m a creature of habits when it comes to London so no trip to London is complete without seeing some of my old favourites such as Big Ben and the Tower of London or having a drink in my favourite pub in Bayswater. 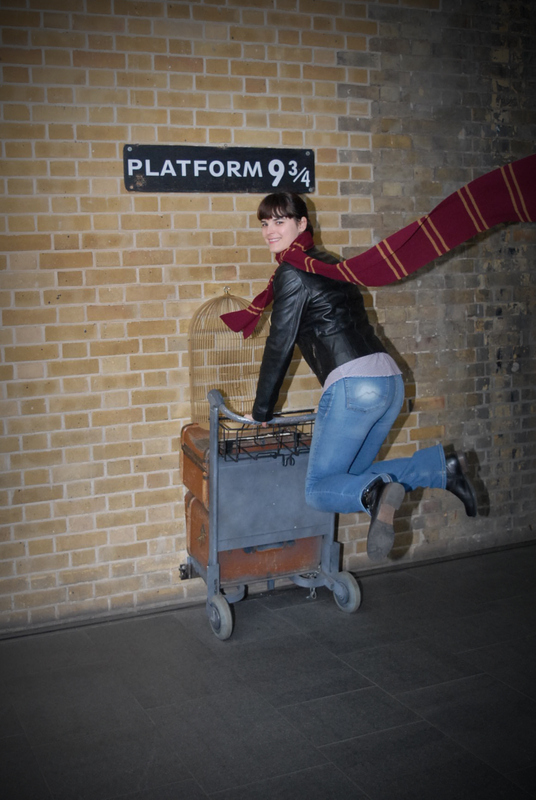 However, London always surprises me with something new, be it a new free attraction or a starry encounter. 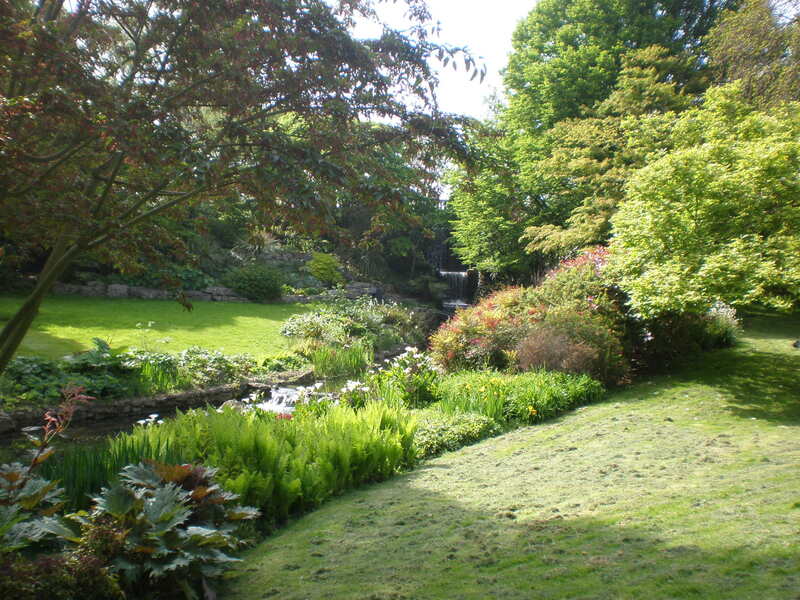 There are a lot of green spaces in London. From the Royal Parks to the small private gardens you’re never too far from a naughty squirrel or two. Whatever the season it’s always enjoyable to spend some time in one of the many London parks. They offer more than just beautiful flowers and trees. You can do sports, have a drink, listen to some music, see a play or entertain your kids. 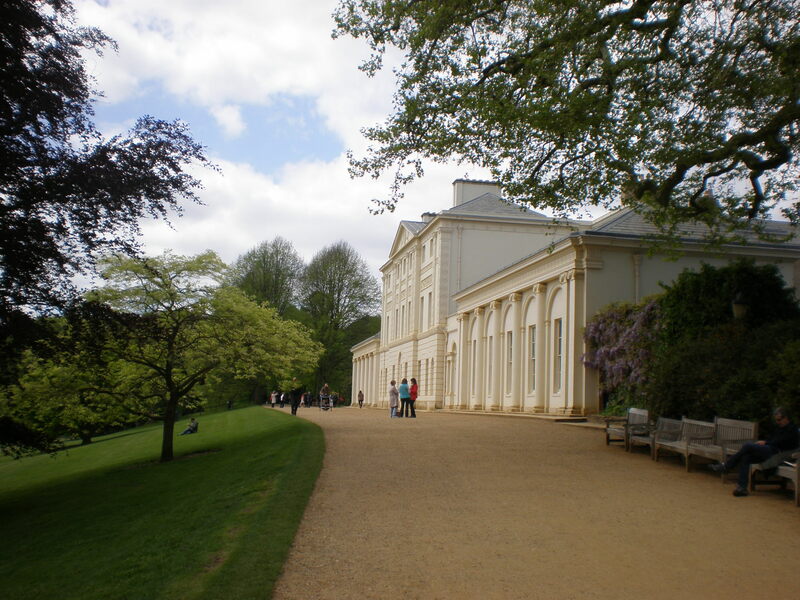 I’m sure all the parks in London are wonderful but here’s the list of my favourite London parks. You’ll find the Kensington palace, the Albert Memorial, the Peter Pan statue and the Princess Diana memorial playground in this beautiful park. It’s the first park I’ve ever visited in London. 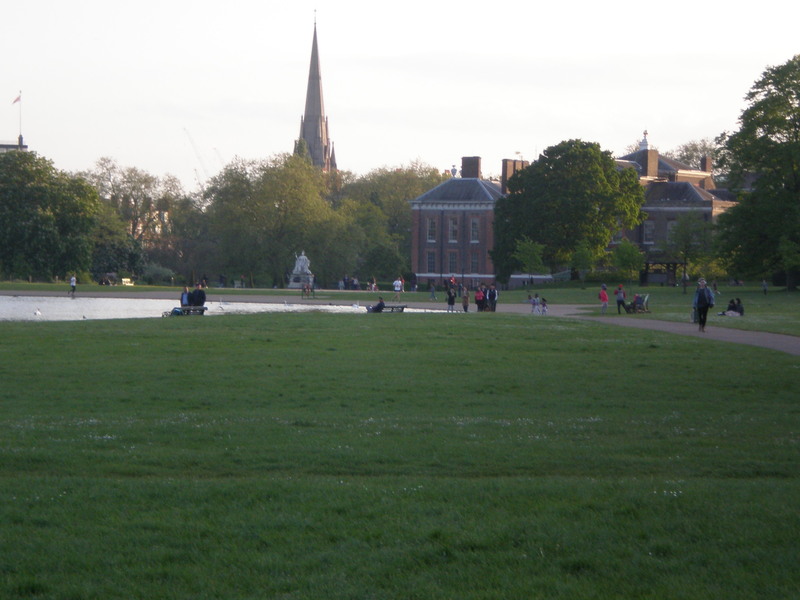 My best friend and I stayed at Bayswater area so we took advantage of our proximity to the Kensington gardens park and spend a lot of time there. We strolled through the park and came across a lot of playful squirrels. A few years later I finally visited the Peter Pan statue too. You can see the pelicans here! How awesome is that? 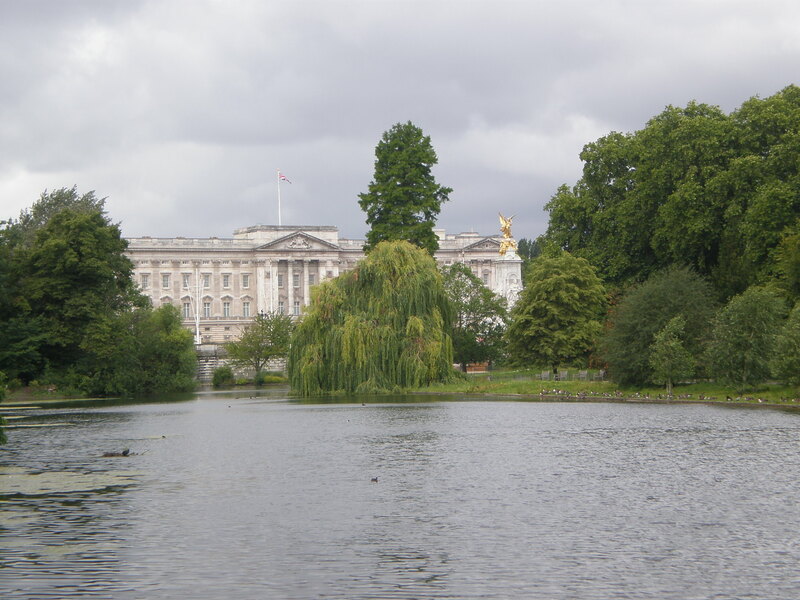 You can also take great photos of the Buckingham palace from this lovely park. I’m not sure whether I saw my first squirrel ever here or at the Kensington park but you can always see friendly squirrels in St James’s park. 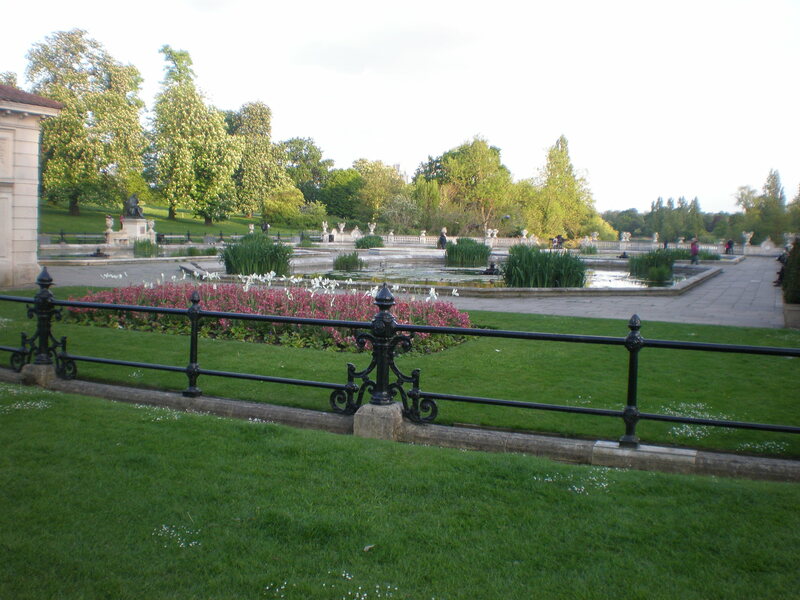 It’s one of the biggest parks in the Central London. You can rent a boat and paddle across the Serpentine lake or just rent a sun lounger and relax in the sun if you’re too lazy to take advantage of one of its sports pitches. There are restaurants and cafes within the park too. If you visit it on a Sunday don’t miss the Speaker’s Corner and listen to people sharing their opinion with the world. I spent some time at Hyde park during my 11th trip to London last year too. I’ve been to London 11 times but this year I visited for the first time the beautiful and affluent London neighbourhood called Hampstead. I spent a wonderful day walking around Hampstead’s charming streets and I bumped into a few celebrities (Emma Thompson and Rowan Atkinson, be still my heart 🙂 ). 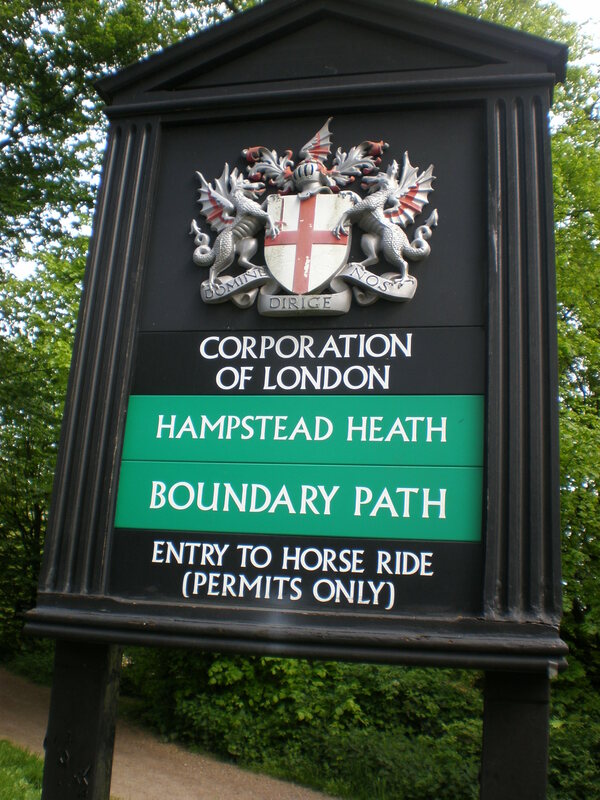 Moreover, I almost got lost in the huge forest-like Hampstead Heath park. There you can find one of the most recognizable properties run by the English Heritage and immortalized in Richard Curtis’s movie Notting Hill. 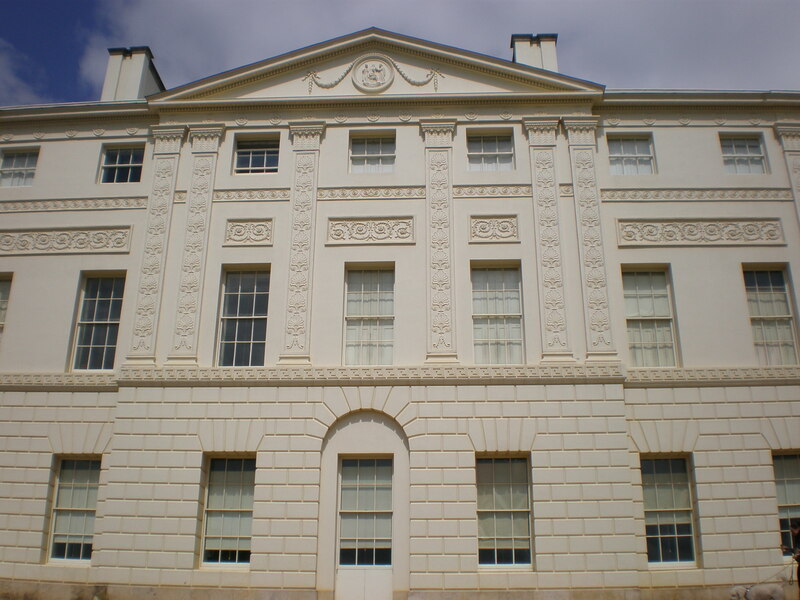 Of course, I’m talking about the Kenwood house. 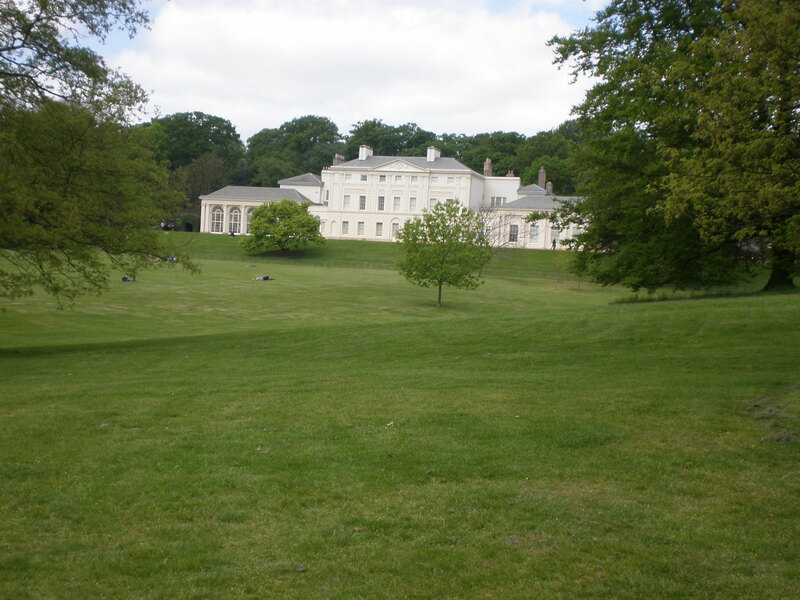 My reason for visiting this stately home was the aforementioned movie with Julia Roberts and Hugh Grant. It’s one of my favourite feel-good movies. 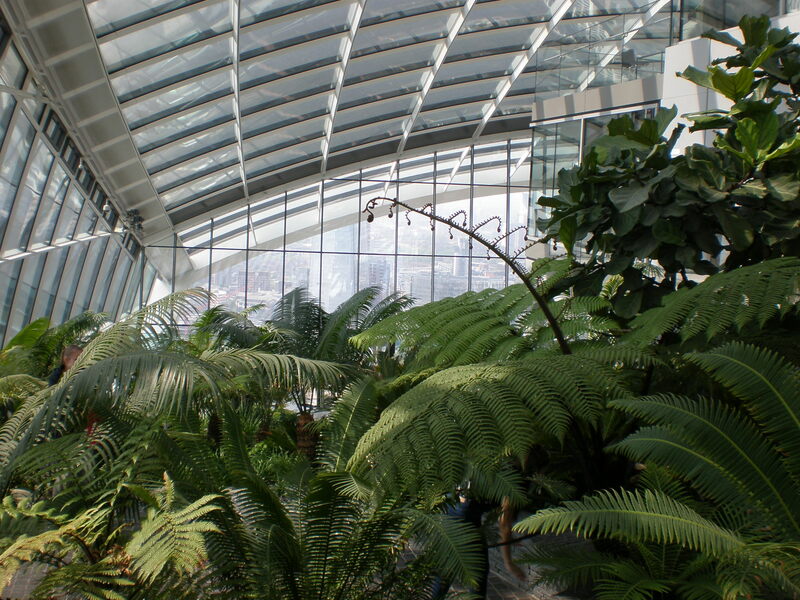 The Sky Garden is located in one of the newest skyscrapers in City of London built in 2004. 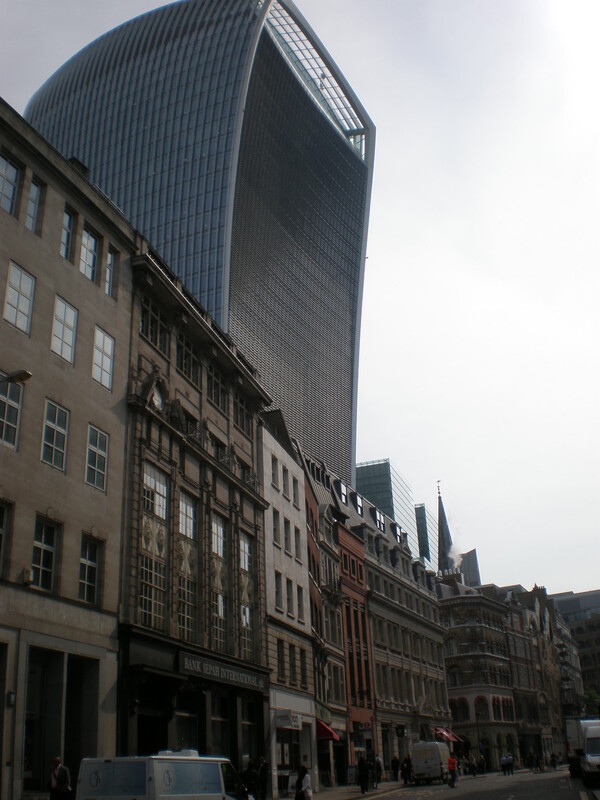 The address is 20 Fenchurch Street and the skyscraper has been lovingly nicknamed Walkie-Talkie. 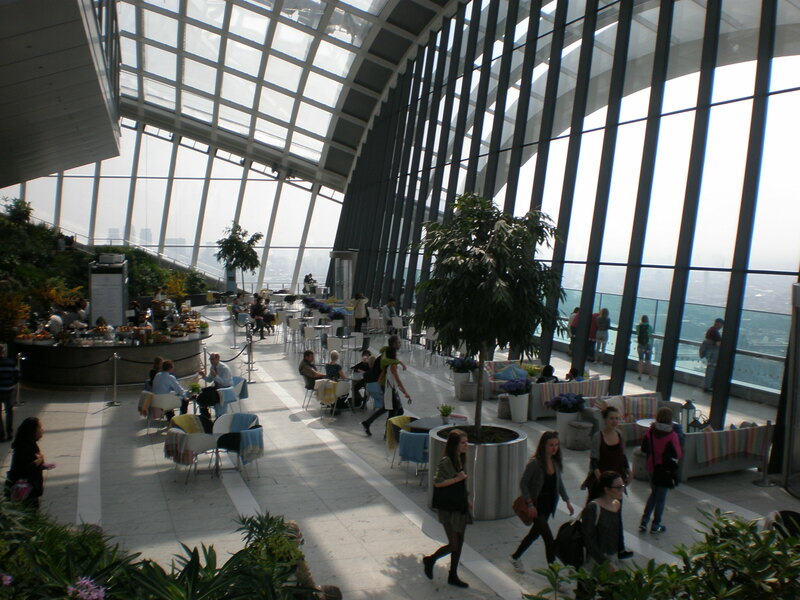 It’s 155 meters tall and the Sky Garden spans three storeys and offers 360° views of London. 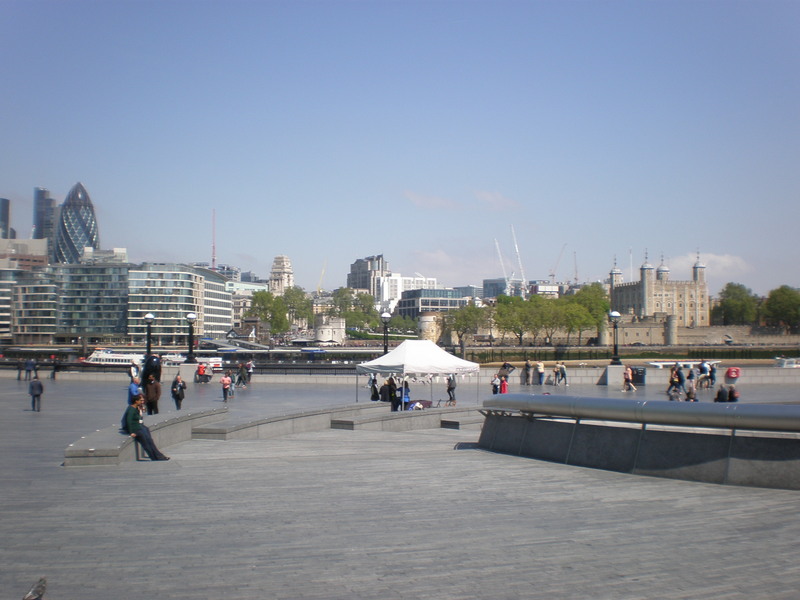 You can admire the views of London from several observation decks and from an open-air terrace where the use of a selfie-stick is prohibited. Sky Garden rightfully holds the claim of the highest public garden. If you get thirsty or hungry go to Sky Pod Bar or to City Garden Bar. There are also two restaurants: Fenchurch restaurant and Darwin Brasserie. 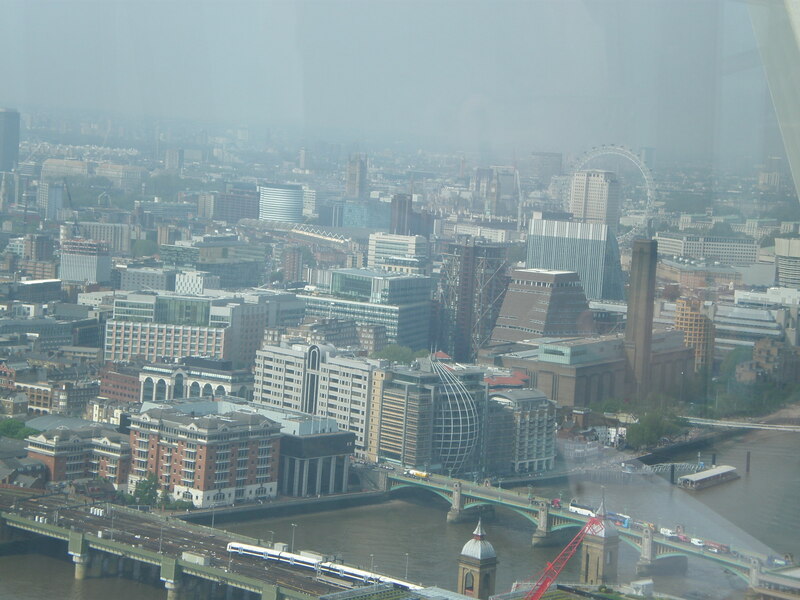 If you want to have a meal at those restaurants then you should book in advance and you use a separate lift from the tourists who are just visiting the Sky Garden. 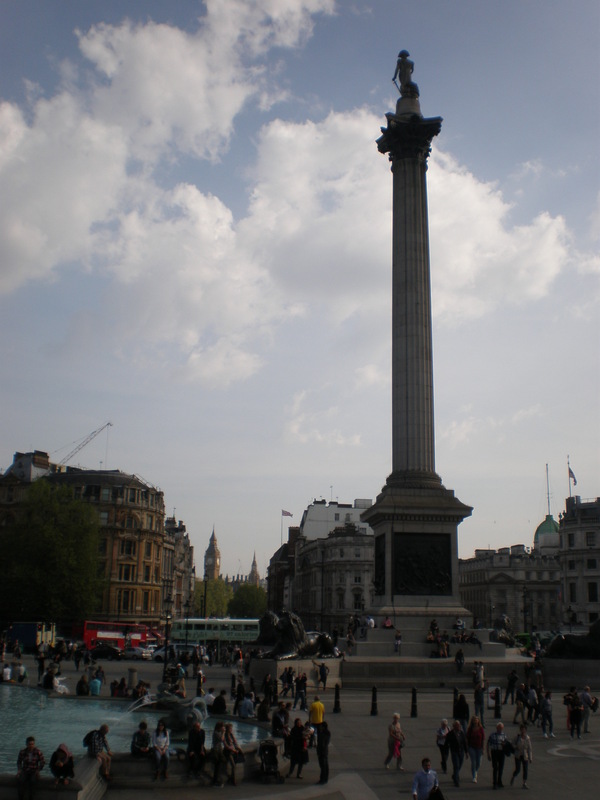 The nearest tube station is the Monument. From there walk for a couple of minutes. Even though the visit is free you need to book it in advance. You can usually do it up to two-three weeks in advance of your planned visit and you need to print out your booking confirmation and bring it with you for your visit. Also, you need to have your ID or your passport with you for your visit. Arrive around 10 minutes before your scheduled visit and wait in queue. Then you’ll walk through airport-like security and be prepared to have your bag searched. After that you’ll enter the express lift with the rest of the people and be at the Sky Garden in a matter of seconds. When you leave the lift, you have all the time you need to admire the views of London and maybe have a drink or eat something. There are also toilets. There are several guards who control whether visitors obey the rules eg. no food or drinks at the open air terrace and no selfie-sticks. 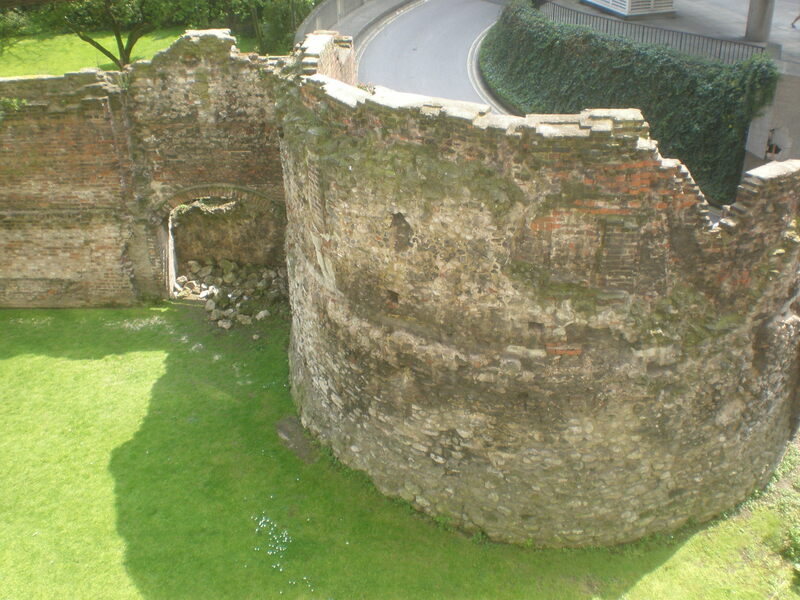 London is a vast, cosmopolitan and modern city but it has also got a very rich history. It is easy to forget this fact when you’re standing among the newest skyscrapers and high-rise buildings in the very heart of London: the City of London. But that history is actually quite present. You just need to know where to look. So the next time you’re walking down the busy streets of London look up or look down and you just might spot the London Stone for example. 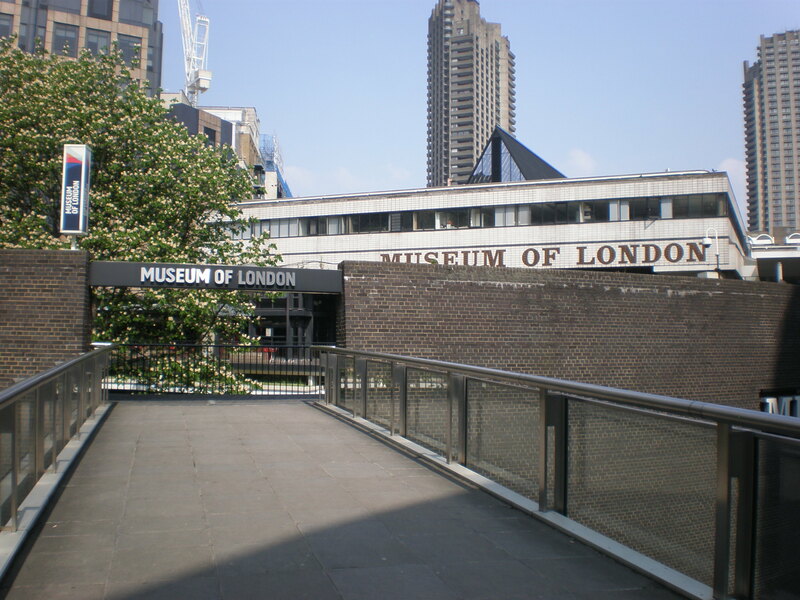 However, the easiest way to learn about the history of London is to visit the Museum of London which is close to the Barbican center and St Paul’s. 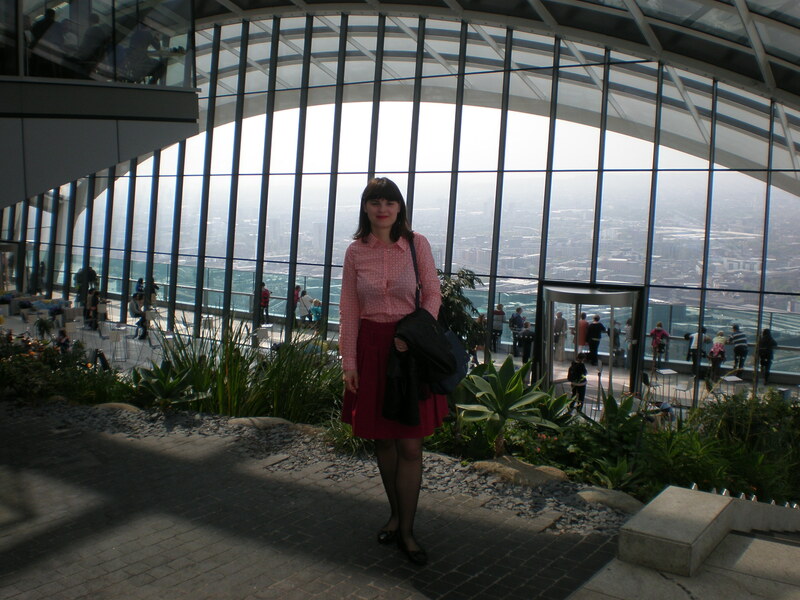 First impressions: After visiting the Sky garden I walked down the streets of London in the direction of the Museum of London. The building itself is modern but ugly I dare say. However, as you well know the looks aren’t important, it’s what’s inside that counts. The entrance is free which is great! I entered the museum and followed the suggested route to see all the permanent exhibitions. What can you see in the museum? 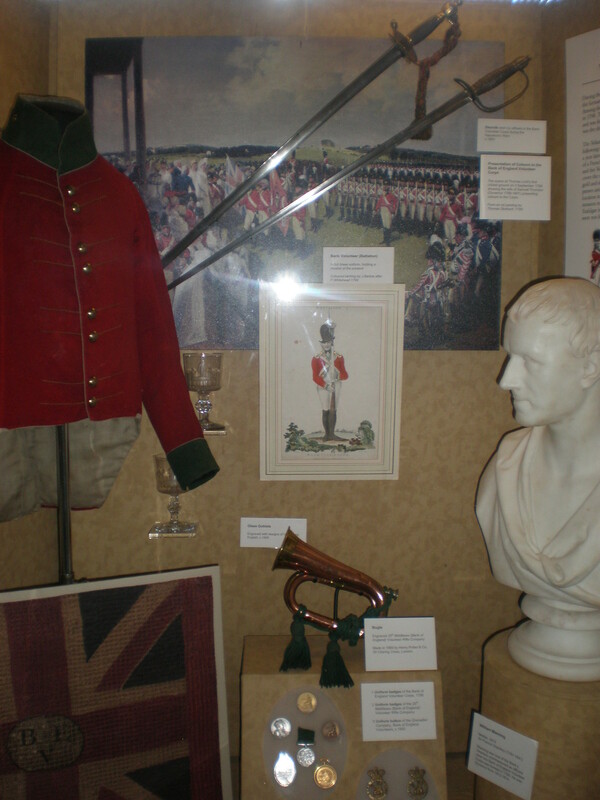 The museum was established in 1976 and there are currently plans to move the museum to a new location. According to Wikipedia the Museum of London houses the largest urban history collection in the world. The permanent exhibitions include: London before London (prehistory mainly), Roman London, Medieval London, War, Plague & Fire, Expanding City, People’s City gallery (there’s an actual red phone box! 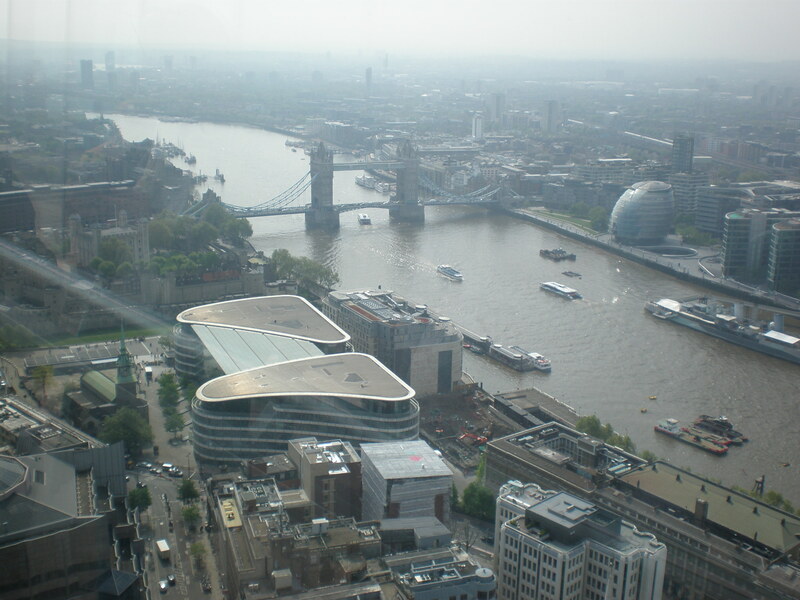 ), World City, The City Gallery (very small) and the London 2012 Cauldron. Money, money, money..makes the world go round! I strongly disagree! I’m not like Carrie from SATC that my money hangs in my closet but I can still see where my money has gone..I just need to open a photo album and see all my beautiful travel photos! Thus visiting a bank museum isn’t exactly something I’d normally do. 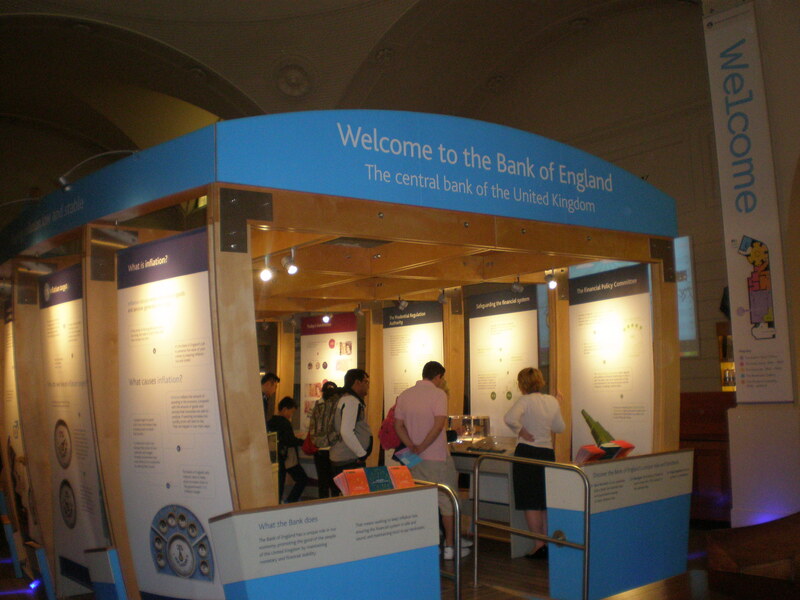 On my recent trip to London (this May) I visited the Bank of England Museum. I have done a lot of free museums in London and when I saw that the Museums at Night festival coincides with my visit to London I decided to choose one of the museums that stayed open longer because of the festival. I browsed the Museums at Night website and I decided to go to the Bank of England Museum mainly because it was free and small and looked interesting enough. 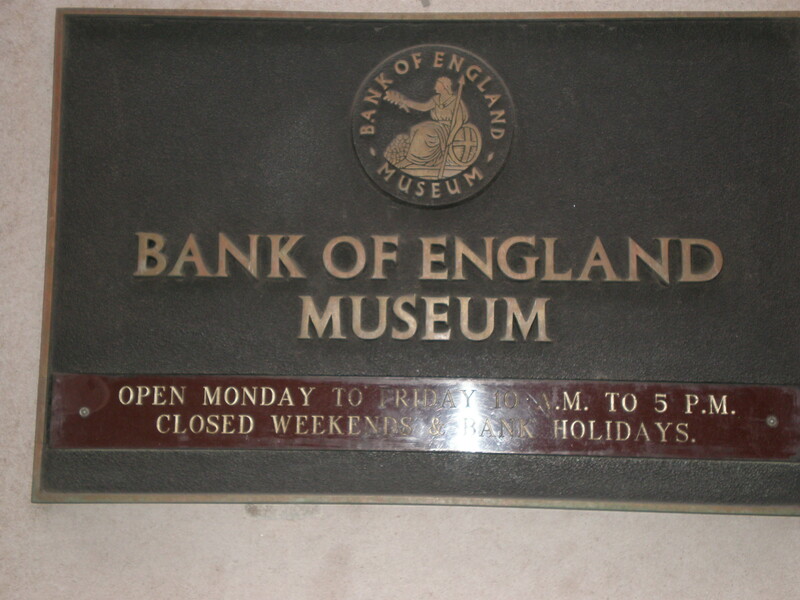 Of course, the Bank of England Museum is situated in the Bank of England building in the City of London. The closest tube station is Bank but even though I have walked around the City before and have certainly been on the Royal Exchange square more than once I was slightly confused to where is exactly the entrance to the museum. The Bank is to the left of the square but the museum’s entrance is in the small street Bartholomew Lane. At the museum’s entrance you go through airport-like security and then go into a big room. It was around 7 pm (the museum is usually open until 5 pm) and there were quite a few people wandering around the museum. 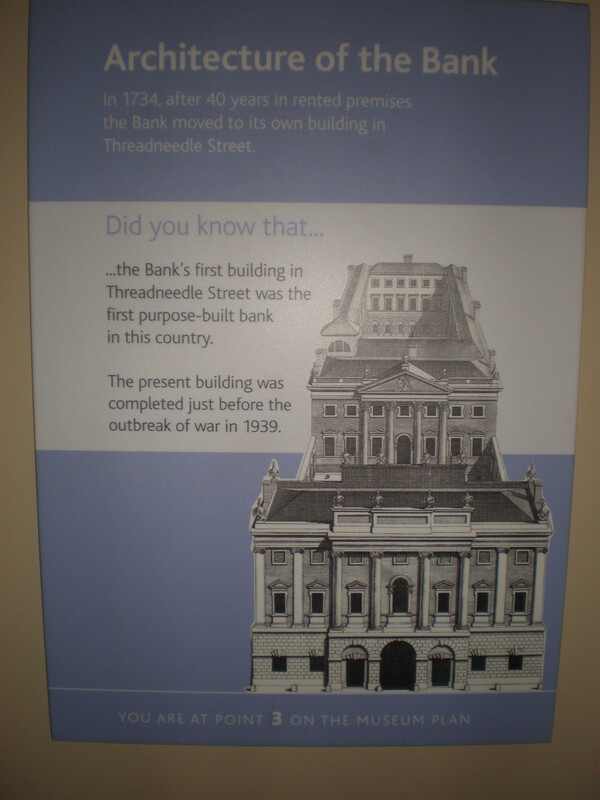 I was looking at some old photos of the bank building when a museum guide approached me and started speaking quickly about the bank’s history. I don’t know whether this happens usually. I guess this was because of the Museums at Night festival. I saw several other people looking amused too when they were approached by other museum guides.